Crowley has earned the respect of our publishers who feel confident sending their one-of-a-kind materials to the bureau. That confidence is translating into tremendous growth for SmallTownPapers. Bound books. Oversize documents. Bound and loose newspapers. Maps. Engineering drawings. No matter the size or binding, Crowley Imaging has long been an industry leader in large-format scanners and large-format scanning services, scanning everything from incunabula (printed materials pre-dating 1501) to deed books to original manuscripts to Presidential papers. Using only equipment of the highest technology and practicing the most careful document handling procedures, Crowley Imaging partners with clients to preserve historic, corporate and culturally significant collections through proven large-format scanning procedures. Zeutschel-engineered scanners, in use by the U.S. National Archives and Records Administration among many other prestigious institutions worldwide, allow for imaging of the smallest bound book to oversize books and newspapers with an open dimension of up to 33” x 47”. Large-format scanners facilitate the processing of these needs. Responsive book cradles ensure that bindings are protected as the cradle gives way to the weight of the binding. Project management staff communicates with each customer to ensure a thorough understanding of the existing condition of the collection in order to create a solution that will deliver a quality product in a timely fashion at a competitive price. Need help determining your document size? Click here to view a detailed list of A-series and ANSI paper sizes. Looking for document scanners? Click here. The Crowley programming staff has proven experience in managing data conversions. This expertise allows for final output integration into the wide array of document management solutions on the market today or into a custom solution engineered for a specific business application. Do you have a project in need of large-format scanners? 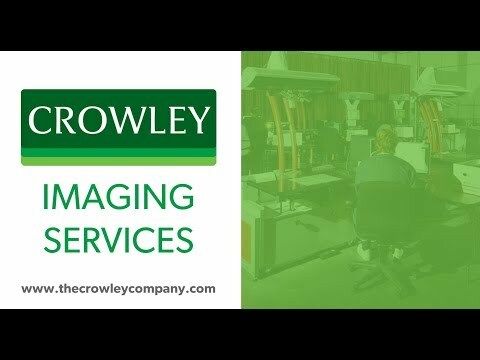 Whether the needs are internal, external or for web distribution, Crowley Imaging has the large-format scanning capabilities to provide the needed solution to integrate digitized images into a workflow. Looking for large-format scanners or solutions? Get in touch with us for your large-format scanning needs today.